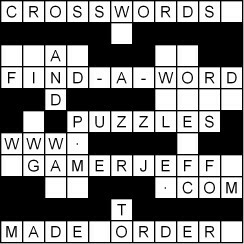 Are you looking for crossword puzzles? Word searches? Sudoku? You found the right place to supply all of your needs! We supply companies and groups crossword puzzles, find-a-words, cryptics, Sudokus and more! Some are used for inter-departmental group functions, special meetings, family picnics and reunions, monthly or quarterly newsletters and more! Whatever the function or special occasion, we can provide the fun and entertainment! Puzzle Samples | Custom shapes | Themed word lists | Rates & Prices | Order Form | Contact us!